Speech given recently (12 March 2019) by HM Ambassador Alison Kemp at the launch event in Podgorica. At the Western Balkans Summit in London in July, British Prime Minister Theresa May announced a package of measures to help build a more peaceful, prosperous and democratic Western Balkans. 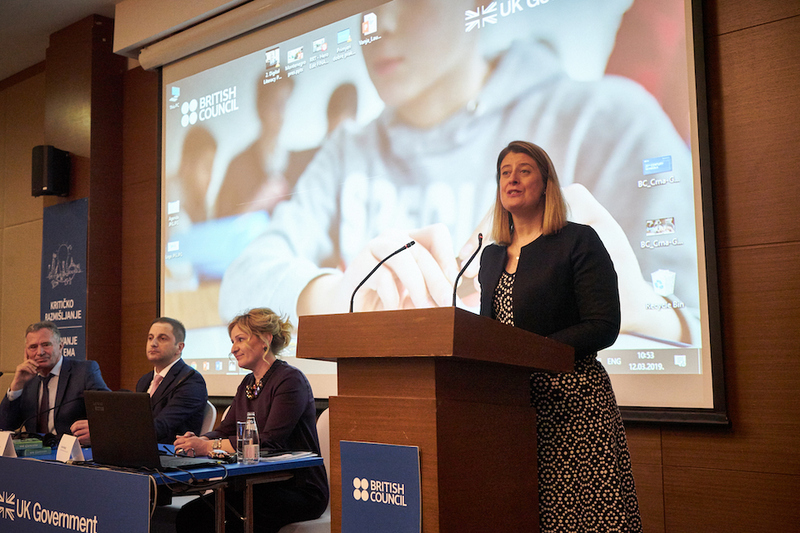 One of the most important ways in which the United Kingdom is demonstrating its commitment to the Western Balkans is through today’s launch of the British Council’s 21st Century Schools programme. 21st Century Schools is a £10 million programme which will bring innovative teaching, focusing on problem solving and critical thinking, while also equipping the students aged 10-15 years with coding skills to every primary schools in Montenegro, indeed to every school in the Western Balkans. This programme is a clear signal of the UK’s continuing commitment to the region. No country has ever made a commitment on this scale to education in the Western Balkans. No country has ever made a commitment on this scale to the future of young people in this region. It’s not often a British Ambassador gets to quote Whitney Houston, but when I was writing today’s remarks, her lyrics “I believe the children are our future. Teach them well and let them lead the way …” kept running through my head. And she was right. If we keep on teaching children to use the technology we already know how to use, we will never be able to keep up with their creativity, and will be hindering rather than helping them prepare for a future which is increasingly digital. The United Kingdom is a world leader in using computing in education. And we recognise that given the speed at which technology moves, school systems need to focus on developing the core skills students will need in the future, rather than learning about systems and concepts which may shortly become superannuated. 21st Century Schools will share the UK’s experience of developing core skills through the primary school curriculum. The focus on core skills is particularly relevant in the Western Balkans, where countries perform far below the OECD average. For example in the 2015 PISA tests, 52% of students tested in Montenegro do not possess adequate maths skills, compared with the OECD average of 30%. And the lack of these core skills is frustrating for those who are seeking employment and businesses seeking employees. Across the Western Balkans, education is still to be fully aligned to labour market needs; meaning jobs lie empty because there are a lack of people with IT and digital skills. This programme has been designed to work with education authorities and leaders to address these issues. While the British Council will be rolling out this programme to all six Western Balkans countries, it is up to each country to tailor the programme so it meets your needs. And that is why the support of Minister Šehović and Director Sejarić, and the collaboration with the Montenegrin government has been so important. I want to thank you and your teams for your support as the British Council rolled the programme out to 20 pilot schools over the last 12 months. And I look forward to working with you as 21st Century Schools spreads across the country. To conclude: this is the largest investment by the UK Government in Education in the Western Balkans, and I’m delighted that the British government is undertaking this programme as the British Council celebrates its 80th anniversary in the region this year, and the 25th anniversary of the opening of the British Council in Montenegro. 80 years ago the British Council began its activities in Serbia and Montenegro with tennis lessons in Serbia and tea dances in Cetinje. And 25 years ago, the British Council began to offer scholarships, examinations and the opportunity to study and research at the British Council library. How the times have changed! But the Council’s commitment to sharing the best of the United Kingdom with the world has not changed, and I hope that this programme will touch every family in Montenegro, as I imagine every family in Montenegro knows either a student or a teacher at a primary school. And more specifically, as we launch a programme to equip young Montenegrins with some of the skills they need to move through life with success and assurance, we are also celebrating the 30th birthday of the World Wide Web, created by Sir Tim Berners Lee in CERN as a way of improving information flows. His web has already transformed the world in the last 30 years, and who knows how students using micro:bits in Montenegrin schools will transform our digital and physical worlds in the next 30 years. I am looking forward to finding out.